Another successful Goffs November Sale for Swordlestown Little and it is Third Dimension's time to shine! Third Dimension is this year's star of our broodmare band! We were lucky enough to complete another good sale at Goffs yesterday. The hottest sire of the moment, Ballylinch's Lope de Vega, supplied many of the top lots and hence there was plenty of interest in our colt. He is a good-moving, correct colt with a great temperament. He coped well with the rigours of a demanding sale, having had over 100 shows spread over just 2 days. Our thanks go to our great team of Dee and Tom who did a fantastic job. The colt was eventually sold to Grove Stud, renowned pinhookers, who bought the Lilbourne Lad - Nisriyna colt from us last year. They were obviously happy with the 30k profit they made on him and came back for another one. We wish them the best of luck with the Lope colt. Paul Shanahan of Coolmore was the underbidder. The sweet Lilbourne Lad - Nisriyna filly also found a new home, with a very nice gentlemen, Mr. Craik-White, who has embarked on the pinhooking trail for the first time. She may well turn out to be a shrewd buy as her two year old Zebedee brother is well placed to add more wins to his tally of two and her full brother has joined the hugely prolific Irish trainer Ger Lyons. We congratulate Jacqueline Norris who once again supplied 4 of the top ten foals including the 540k Galileo half sister to Toronado. A great achievement was also realised by our neighbours Middlelane Farm who turned over close to half a million euros with their five lovely colt foals. 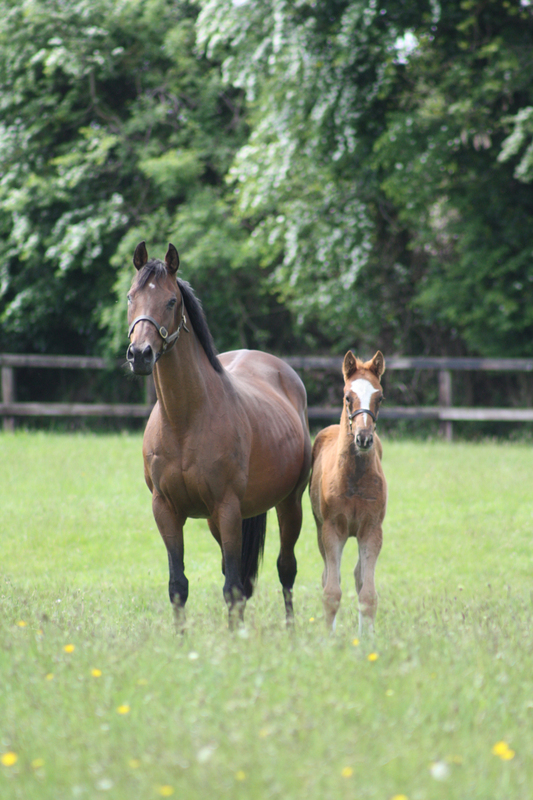 This is a fantastic result with their small broodmare band of 7 or so mares. It is a family run farm, where everyone gets involved. What a pleasure it is to see the small breeders achieving such success! 2014 has been a fantastic year for Third Dimension, also affectionately know as Chouchoux. 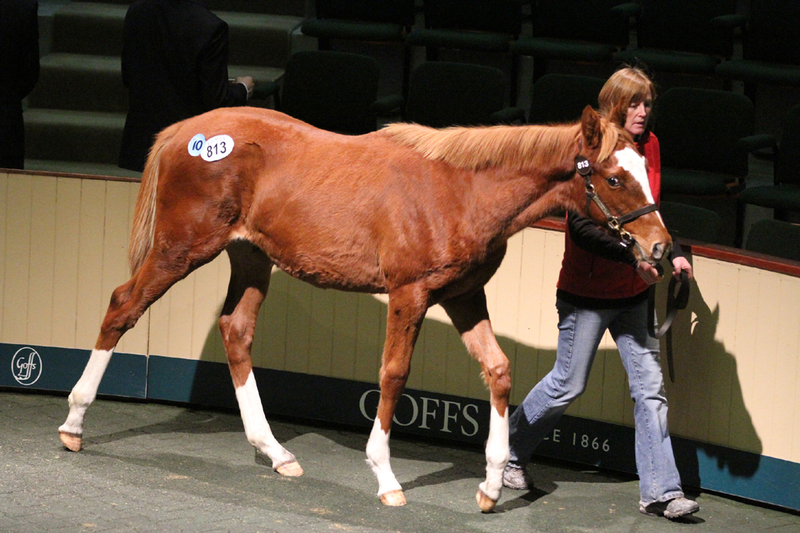 Her 2013 Arcano colt was sold for 56k at Goffs February Sale. He was resold by Rathbarry Stud for 92k at this year's Goffs Orby Sale and has joined trainer Keith Dalgleish in England. Orgilgo Bay won the feature race at this year's Tralee harvest festival and added several more black type hurdle placings to his CV, most notably a third in the very prestigious Fred Winter Juvenile hurde at this year's Cheltenham Festival. However, Third Dimension's influence reaches far and wide. 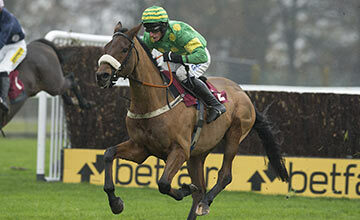 Her six times winning and Listed placed daughter My Pension got exported to India when in foal to Footstepsinthesand. The resulting foal was named Maisha and has established herself as the Champion three year old filly in India this year. She is the winner of three races, all of Indian Group status and is placed second in three of the best Indian races for three year olds. She is the only filly in India this year to have beaten the colts in a Gr. 1 race. All Indian Group races are catalogued in Europe as Listed, so she is clearly a very good and consistant filly by any standards. Third Dimension is in foal to Australian sprinter Epaulette. Third Intention (by Azamour), now a seven year old, has opened his 14/15 season with a convincing win in a Class 2 Chase at Haydock. Cheltenham 2015 surely beckons again! What a great horse to own for fhe lovely Tizzard family. Third Intention wins the Cl 2 Oak Loans and Mortgage Graduations Chase at Haydock by 17 lenghts!